What can an App do for your School? When you send a push notification would you like your parents to be able to reply to the message to ask for more information? All our Apps for Schools allow the school admin to manage their own content. This includes assigning custom icons to each page. You can choose the icon that best suits the content. A picture tells a thousand words.... what about a picture of a class activity? You know that in primary schools parents are still interested in their child's classroom adventures. Everyone connected to School, parents, students, governors and staff need to be kept up to date with with school news. Imagine if you could send attachments with your push notifications? You can and its free, all included in our basic app cost! All schools need surveys, questionaires, permission slips. Now you can create and use them in your school app. Upload school documents easily in to your app. Newsletters, school letters, homework tasks, policies are easy to upload PDFs, plain text or image files to your app. We know school admins are already extremely busy. We've made it easy to automatically sync your website's content with your app. Our school apps come with a school calendar that can display all kinds of events, either in a standard calendar, in a list view, or if you want both. This is the big one! We create your School's App using your images and school colours and we can give you your own app in the Apple and Google app stores. 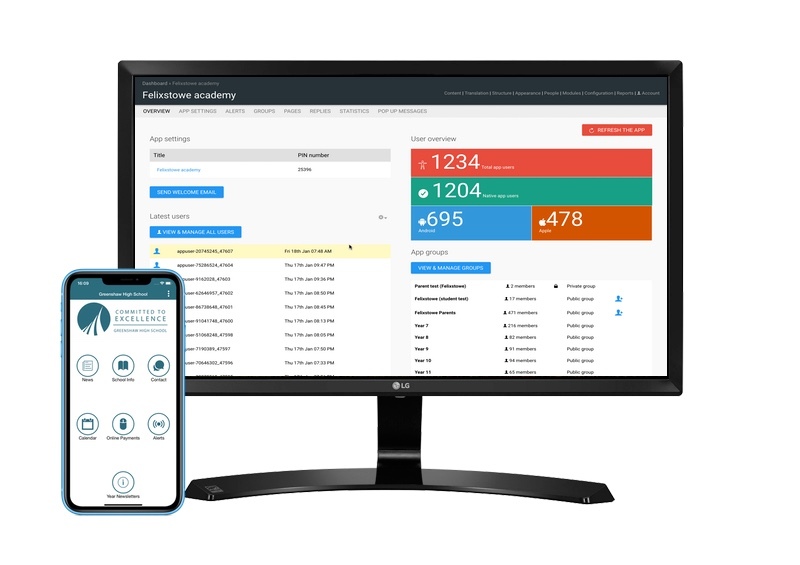 Import student timetables, homework attendance and more from your school's management information system.. Term dates are a crucial function of an app for schools. Being able to see whether a date is within the school term is necessary for busy parents. Our school app is easy to use, manage your app from a desktop or tablet, or even from a mobile using our web control panel. You Tube videos can commmunicate a lot more than just words or even images. With Apps for Schools integrate your school's YouTube channel in to the app.